Four Winns HD 200 open bow deck boat. Powered by Mercury's second generation 200hp four stroke outboard motor. Four Winns single axle trailer with aluminum mags, wheel jack and swing away tongue. Bimini top, bow cover, cockpit cover, reed matting snap in carpet, swim platform rubber mats, walk thru doors, bow fill in cushion and set in back rest too. Hide away waste paper basket. Premium Sound Upgrade. Pull up cleats. Bow scuff plate. Swing up bolster seats with swivels and sliders. Ski Tow Pylon. Owning the water comes naturally when you're behind the helm of new HD 200 OB. 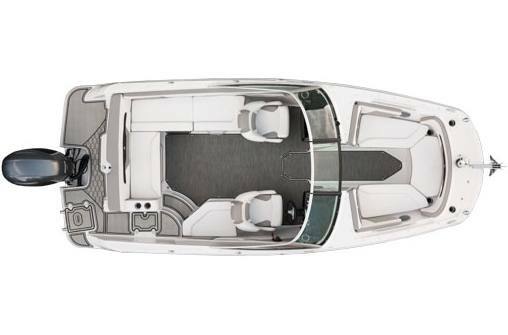 The plush, L-shaped seating allows you to kick back to the fullest while the deep, bucket seats keep you snug when underway. She's everything you could ask for; the perfect combination of elegance and versatility.